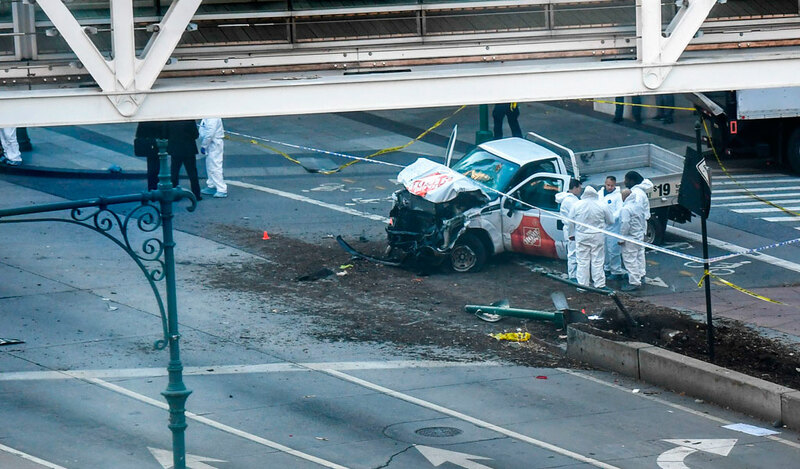 Yesterday’s terrorist attack in New York City was carried out by a 29-year-old Muslim Jihadist Terrorist who rented a Home Depot truck and drove it onto a bike path. Such forms of attack are extremely simple to carry out. They need little planning, no coordination with a central organization and are not difficult to obtain equipment. They are therefore impossible to stop with security. This deliberate incident once again highlights the importance of focusing resources on the immigration of Muslims. As incidents of this nature are impossible, for security services to predict and stop. And they are on the increase and will continue until the terrorist is eliminated. Even though New York is not unguarded. Entering the United States requires extensive security checks. Immigration from countries like Uzbekistan (the nationality of this particular terrorist) is complex and requires background checks, but it doesn’t even consider the fact that all Muslims according to their own ideology are Jihadists and so they are ‘all’ potential terrorists. The FBI and CIA carry out extensive surveillance operations around the world. They monitor correspondence, tap phone conversations and pay informants. They have spies inside foreign governments and inside terrorist organizations. They even have reconnaissance satellites in space. America’s security services work intently to protect this country from every conceivable foe, and some of the time they succeed. The United States government spends more than $16 billion annually to counter terrorism. They can even use drones to kill any designated target pretty much anywhere in the world. But it’s as if they were trying to swim up a waterfall. They’re just spinning their wheels. With all this technology and money, they cannot read people’s minds and cannot prevent Muslims from just deciding to run people over with a truck. 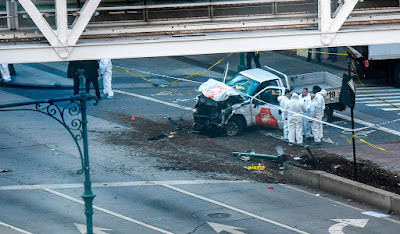 Muslims decide to carry out attacks like this in the name of their ideology and their evil god Allah. An ideology they find powerful enough to die for. All the security in the world cannot prevent individuals who believe in satanic evil from acting in the name of that belief: Which is…killing random civilians that will eventually trigger a war between Muslims and the West that they crave and enable them to usher in their totalitarian Caliphate. They will always find new ways to attack and new ways to hide because it simply isn’t possible to eliminate every potential avenue of terror. THE BOTTOM LINE: The only way to end Islamic terrorism once and for all, is to eliminate the cause and the ideology which fuels them. The media says that “he was following the ISIS playbook” and they tell you that it is something found on the internet. But what they ignorantly don’t tell you is that the real playbooks that the internet statement comes from – are the real playbooks, the ideology that is found in the Quran, the Hadith, and the Sunnah. The most logical thing to do is to destroy the ideology, but until someone figures out just how to accomplish that, we absolutely need to eliminate those that follow the ideology. If the security agencies really wanted to eliminate terrorism they would eliminate the terrorists. All Muslims are Jihadists which means the ideology of Islam is to abolish the present government and law, and replace it with the government of Islam and the Islamic law of Sharia any way they can. Some Muslim Jihadists are terrorist who prefer to accomplish that goal by force of violence. Either way the goal of all Muslims is the same.